O my, this is my very first entry for a layered dessert and ooo, I just loved it. Wow factor lies in the fresh fruit syrup and with the combo of vanilla essence n banana , all makes my mouth rhymes mmmm.. Lovely dessert, and again u can whip up this dessert easily , even with preserves too..How good is that ? Here I've replaced the whipped cream with hearty yoghurt, u may go for greek yoghurt , if u prefer.. Simply awesome and prefect for this season. Just let free ur mind and do come up with different varieties of ur own. Am gonna make more varieties soon..till then NJOY !!! Banana -- 1 no . Cookie ( I used snickerdoodle) -- 2 nos. Puree the raspberries with a tbsp of sugar and filter to remove the pits. Blend the banana with the vanilla essence , water and sugar and make it ready. Take a serving glass and pour in couple of tbsp of the raspberry syrup to form a layer. Followed by a thin layer of yoghurt and even it . Then pour in a tbsp of the banana syrup and pat the glass gently . Now add the slices of bananas on the top and make a even layer. Crumble the cookie and add on the top of the banana slices. 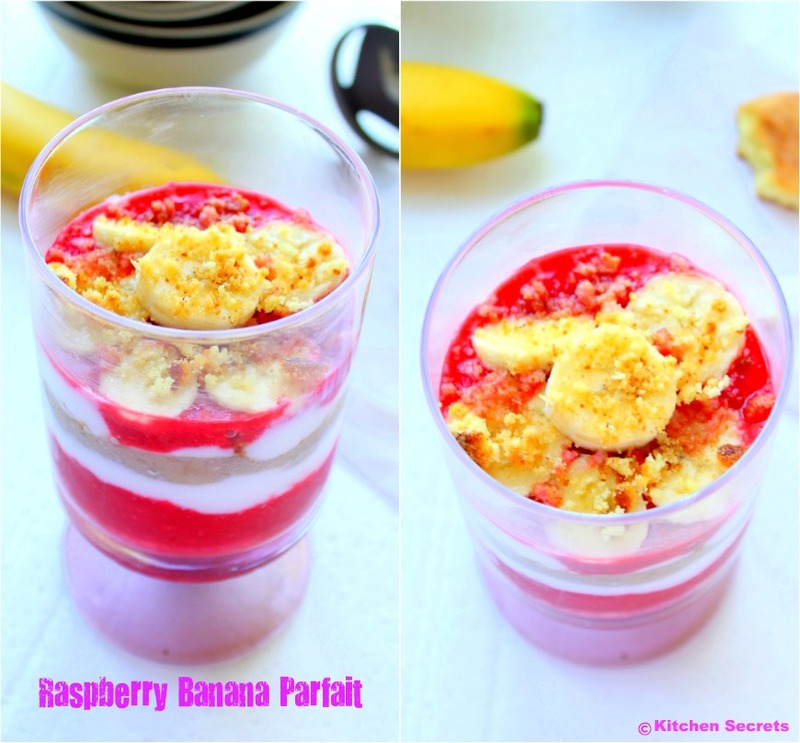 Again start pouring the yoghurt , raspberry syrup one by one until u've almost filled the glasses and finally top it with the slices of banana and cookie crumble..
Chill the parfait for 10 minutes and serve chilled. But one thing, do not add the cookie crumble on top if u r going to refrigerate, just add when u r ready to serve. Will post my snickerdoodle cookie recipe soon. U may add any cookie u want, preferably a bit soft cookie. U may also use frozen raspberries, in case , u don't get the fresh one's. looks so wonderful and nice colorful !! Beautiful and delicious, awesome clicks. Heavenly looking raspberry preparation dear. Wonderful presentation. Wow, wow,wow is all I could say after seeing the click, a perfect blend. 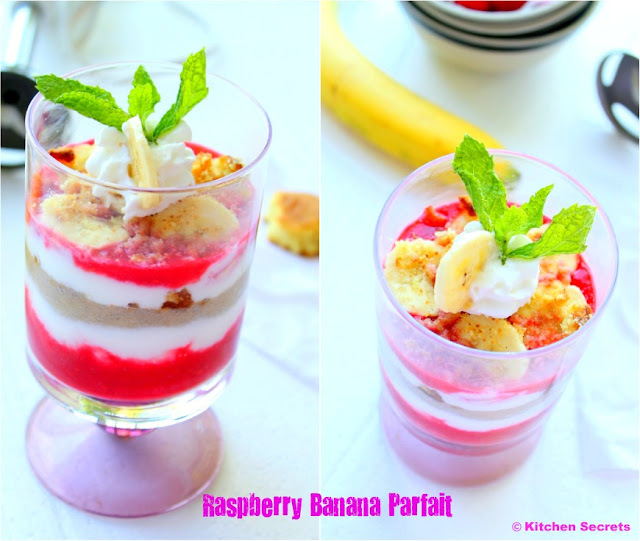 Super colorful post.. loved the raspberry and banana combo.. thanks for sending to both my events.. Colorful and yummy dear .. nice clicks. Combo is the best. Utterly beautiful. Wowwwwwww... Looks so colorful and tempting.. Love the recipe and presentation.. Awesome clicks too !! looks so colorful n yummy..
so colourful n delicious parfait...nice click! Delicious layered dessert, colorful & elegant looking! looks soooo colourful n delicious!! 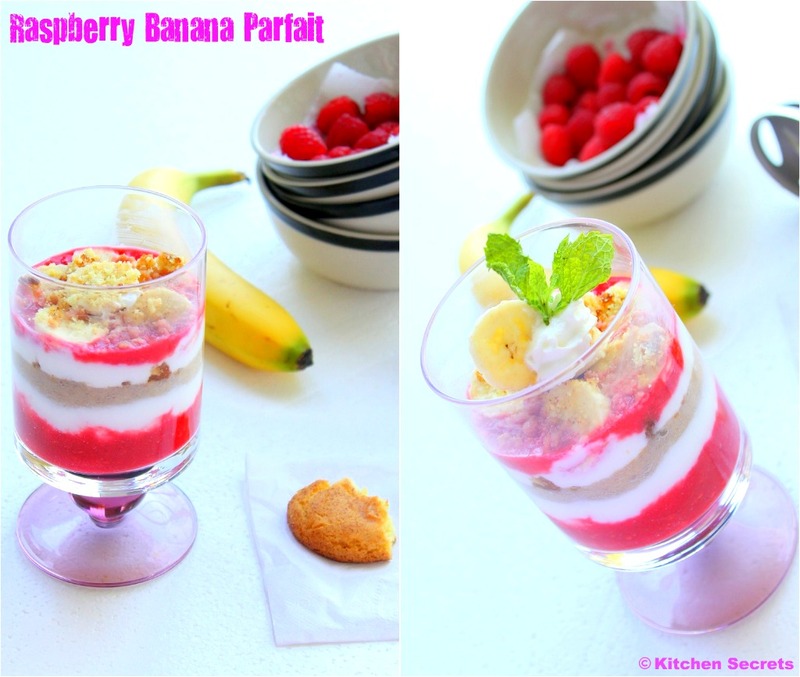 Omg, parfait looks absolutely divine, wonderful and gorgeous.. OMG!!! Classy!!! Bookmarked this one Shanavi dear!!! Wonderful dessert looks divine,lovely color and combo. Yum, that looks absolutely gorgeous and perfect, thanks for linking it to our bookmarked event. Oh my! So gorgeous. Love that colorful presentation. Want to dig into this right now:)...the layers look so attractive and colourful...yummy!! 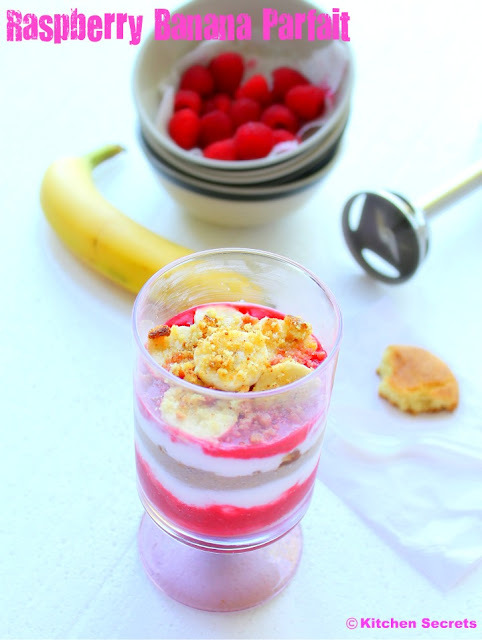 Love this healthy dessert idea, looks gorgeous. Looks perfect, tempting and colorful. You have a nice space dear, glad to follow you, do stop by mine when you are free.